Once all my pieces were cut, I stamped the image from the Artistic Outpost Think and Wonder set in Black Archival on the Confetti panel, and colored using STAEDTLER Karat Aquarell Watercolor Crayons. When coloring with WC Crayons I just scribble my crayon onto the back of an acrylic block then use an H20 Brush to pick up the color. The edges of all panels are sponged with Ranger Gathered Twigs Distress Ink. To create the flowers, I pinched the petals of the 3D Ruffle Flower between my index finger and thumb, and layered them on top of each other rotating the layers. Here's a close up of the blossom. very cool! Looks like a lot of things to do on that. This is lovely. Great design and the colours are perfect. Fab use of the sketch. The girl from Think and Wonder looks wonderful framed out. Beautiful! Ok, now you have my attention....I can't believe how you just layered out your papers on the mat...that is sooo interesting! 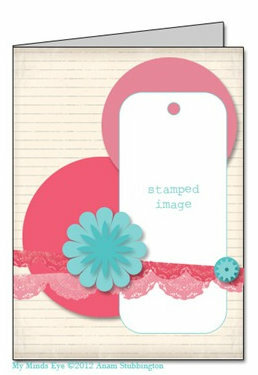 Love the card and the pinched flower, a die? Beautiful card ans so amazing how you set it up to cut out! Well Lisa, I am not sure what is more amazing, the card or all the steps in the designing process. Absolutely gorgeous! Have a great evening! You are getting to be quite the techie. Love your card. Beautiful.